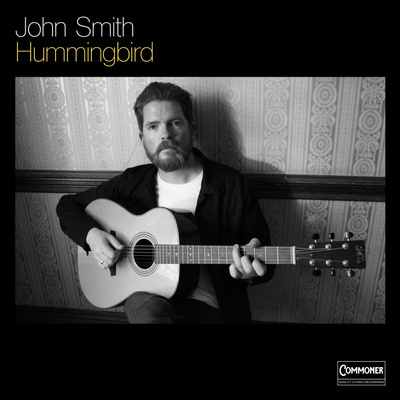 "Hummingbird" (radio edit) & "Willy Moore"
UK-based critically-acclaimed folk/Americana maestro John Smith, who has released five albums and toured the world for almost fifteen years playing as a session guitarist and singer for the likes of Joan Baez, Lisa Hannigan, and David Gray, will release his latest album Hummingbird in the US on March 22 via Commoner Records/Thirty Tigers. Smith became a folk devotee as a teenager after hearing artists like John Renbourn for the first time; Renbourn, a major inspiration and influence on Smith's art, has since dubbed the artist "the future of folk music." "The six strings of my guitar have granted me access to a sacred space between things, the unconscious interweaving sensations that allow us that gentle buzz on hearing a good folk song," Smith explains. "I’ve been immeasurably fortunate to open for and even play with some of my heroes and influences in the folk world. Their work and their generosity of spirit have been a constant reminder that I must keep playing, recording and touring, no matter the cost. There is always work to be done in the service of good music." It was with that mindset that Smith once again returned to songwriter and producer Sam Lakeman's studio in Somerset to commit seven of his favorite folk songs to tape alongside three original songs. "With my guitars and notebook, I sat for a week and dug into these songs, some of which I have performed hundreds of times, but never recorded," he recalls. "I always chose instead to concentrate on my own writing. If I didn’t record these songs now, representing the Folk Music that I love, I felt I was going to regret it." The tracks quickly took on their own shape in Lakeman’s able hands; with a "less is more" approach and the help of good friends and fellow powerhouses Cara Dillon, John McCusker and Ben Nicholls, Smith created his purest, most elegant recordings to date. Hummingbird is a moving mix of modern-day folk tunes and other traditional songs that reach as far back as the 15th century. "Willy Moore," is a heart-breaking account of two young lovers’ tragedy, and the title track "Hummingbird," is an original love song written by Smith. •Hummingbird is John Smith’s 6th studio album following 2017’s Headlong.